"I really liked your story, Frankie. I wish I was as weird as you." Frank LaLoggia's Lady In White is set in 1962 in upstate New York, telling the story of nine-year-old Frank Scarlatti (Lukas Haas), an "odd duck" with a penchant for writing scary stories. When he is locked in a school cloakroom for the night by a couple of mischievous classmates, he drifts off to sleep and witnesses a ghostly reenactment of a young girl's murder. His slumber is interrupted by the real-life killer, who returns to the scene of the crime and nearly throttles Frank before abruptly leaving. After the school's janitor is arrested on suspicion of a series of unsolved child murders, the girl's phantom reappears several times, pleading with Frank to help her find her mother. Slowly he and his brother Geno (Jason Presson) discover the girl's relationship to the "Lady in White" who haunts the seaside cliffs, and the identity of her murderer. Director LaLoggia also wrote the largely autobiographical script and composed the score (with arrangements by James Massari)—his personal commitment to the project contributes greatly to its emotional impact. He creates a finely-tuned cinematic experience here—there's a funny and sentimental Jean Shepherd/Norman Rockwell quality to its environment, balanced by its unsettling, genuinely scary (though never gory) moments. He draws convincing performances from a fine cast including Lukas Haas, honest and genuine as young Frank, Alex Rocco in an atypical role as Frank's caring widower father, and Katherine Helmond as an eccentric, mysterious elderly woman. Frank's family life is given significant screen time and enriches the film's emotional content without bogging the film down. LaLoggia clearly loves these characters, but he conducts himself with admirable restraint and the film never seems self-indulgent—while the plot is slightly contrived, it moves along briskly and confidently. The film's effects team delivers some convincing on-set and in-camera effects, though the budget was clearly limited. Several "blue-screen" shots are marred by heavy matte lines, but "black-screen" double-exposure compositions are more effective, with an old-fashioned look that fits in well. There are even a few impressive moving composite shots achieved without "real" motion-control equipment. Period costumes, props, cars and sets are appropriate, with fun Halloween outfits and decorations in the film's early scenes, and the cinematography supports LaLoggia's story well with quality lighting and composition. Lady in White is hard to describe—it must be seen to be appreciated, though it's not in any way a "difficult" or inaccessible film. It's a solid tale well told, with emotional resonance rarely seen in a "ghost story," and it's great to see it on this Special Edition DVD from Elite. Image Transfer Review: Lady in White is presented in its original 1.85:1 theatrical aspect ratio, with a non-anamorphic transfer. Despite the "Digital Superscan" transfer promoted on the keepcase, the image isn't completely up to DVD standard—colors seem a bit oversaturated with occasional smearing, and the digital transfer introduces some "cloudiness" in grainier scenes. The source is generally clean and solid, and the optical shots don't exhibit excessive grain, but an overall softness with middling definition in some scenes gives this disc a laserdisc look, landing it on the lower end of the rating scale. Audio Transfer Review: Lady in White features an excellent Dolby Digital 5.1 audio track that enhances the experience dramatically. The "new" surround track is enveloping and active without seeming gimmicky, utilizing rear panning, subtle atmospherics, a few solid LFE bass effects, and a rich presentation of director/writer/composer Frank LaLoggia's score. Centered dialogue occasionally sounds a little thin among the music and sound effects, but this is a fine, clean 5.1 soundtrack, remarkable for its lack of the "electronically processed" character common to such remixes. This is a terrific bonus, an hour of the film's musical score (three lengthy selections) billed as the "Complete CD Soundtrack" on the packaging, rendered in Dolby Digital 2.0 surround and separate from the film itself (not an isolated score track.) A few text screens of LaLoggia's notes on the soundtrack are included, and the music selections are accompanied by images from the Stills Gallery. The delicate, emotive music holds up very well on its own (it was apparently marketed separately as a CD) and is a valuable addition to this DVD release. Writer/director/composer Frank LaLoggia delivers an enthusiastic running commentary, covering the film's autobiographical origins, its financing, many technical aspects of the production and his own recollections of the film's release, critical reaction and box office results. His comments are filled with humor and affection for what was obviously a deeply personal project, and the track is informative and entertaining to boot. A great selection of promo material for the film, including a 1.85:1 Theatrical trailer, 3 full-frame TV Spots, 4 audio-only Radio spots (!) and the seven-minute, $21K promotional short shown to investors to help raise financing for the film, structured like a lengthy trailer with different actors in many of the roles. All of these segments are presented with monophonic audio and appear to have been mastered from videotape with some visible NTSC noise. Still photographs from the film, navigable with the remote control, although I preferred viewing the stills in pre-timed sequence as accompaniment to the Soundtrack feature. Smeary video work-print footage of 9 scenes cut from the film—sound and image quality are poor, but the material is interesting if not revelatory. Most are extended versions of scenes included in the final film, containing entertaining but non-essential "character moments." Eleven minutes of video footage covering the filmmaking in progress (mostly without sound), gags, effects process shots, and the film's premiere. Not as informative as the director's Commentary, but worth a viewing. 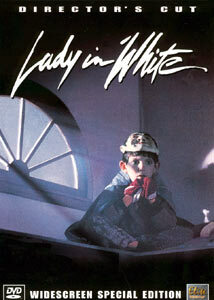 Lady in White is one of those rare films I can recommend to everyone without reservation. Frank LaLoggia achieves a unique combination of naturalistic, small-town family life and intense, supernaturally-themed action, and the film's style is heartfelt but not excessively manipulative. Elite Entertainment's DVD transfer suffers in the image department, but the rich remastered audio and extensive supplements make this an easy rental with strong "buy" potential. Recommended.